5 Star Service – Delivering a personal touch in everything we do in the Heart of Belfast, Northern Ireland. At Kingsbridge Private Hospital - Northern Ireland’s newest Private Hospital you can expect state-of-the-art medical facilities and hospitality more akin to a 5 star hotel than a hospital. A range of treatments and surgeries are available at Kingsbridge Private Hospital – part of Northern Ireland’s leading private healthcare provider, The 3fivetwo Group. These include treatment and surgery for conditions related to gynaecology, orthopaedic surgery, cosmetic surgery, dental treatment and dental surgery. For a full list of treatments and surgery offered by The 3fivetwo Group – Please click here. Why choose Kingsbridge Private Hospital in Northern Ireland? Visitors to Kingsbridge Private Hospital soon discover that Northern Ireland’s reputation for its warmth and hospitality is well-deserved. Our hospital’s nursing staff are always available and on call for patient’s needs and private patients enjoy sole occupancy bedrooms for privacy, access to WiFi, TV, newspapers, en-suite bathroom facilities and complimentary toiletries. The outstanding catering department serves locally sourced produce from only the finest Northern Irish producers, and they cater for all dietary needs including Halal, Asian, Vegetarian, Western and Gluten-free menu options. You can expect the best diagnostic testing and scanning facilities available in Northern Ireland and The United Kingdom, as well as access to highly qualified and world-class consultants who are renowned in their specialist medical fields. Kingsbridge Private Hospital’s Consultants work to the highest evidence-based standards utilising advanced technology in state-of-the-art facilities in a 5-star private hospital in Belfast. Kingsbridge private hospital is situated on Belfast’s prestigious Lisburn Road in Northern Ireland allowing you easy access to Belfast City Centre. Public transport, including train are only 5 minutes from Kingsbridge Private Hospital meaning family and friends are never too far away during your stay at this five star hospital. 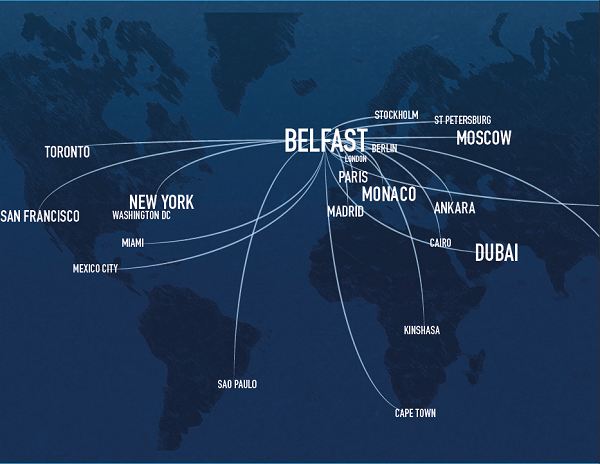 The Hospital is located just a few minutes from both Belfast International Airport and George Best Belfast City Airport on the outer ring. Kingsbridge Private Hospital is also next to the Motorway which links the hospital to Dublin Airport in just over 1 hour. There are daily links to all of the world’s major airports via these three centres. At Kingsbridge Private Hospital in Northern Ireland you can rest assured during your trip that you will have access to the highest levels of medical technology and care currently available in private healthcare throughout the world.